Your eye has a very limited capacity to perceive all the signals around you. You need a microscope to see very small things, a telescope to see things far away, and an infra-red camera to see in the dark. Similarly, a digital light filter - such as Biofield Reader (BFR) - provides another way of allowing you to see more information about your surroundings. It takes the light signals received via video and still cameras and digitally filters them with a computer program; with the aim of revealing changes in light that the eye would not normally see. These changes in light may be the result of interference patterns occurring as light moves in and out of a hypothetical field within and around all things. The original purpose of digitally filtering the light around subjects was to aid human health assessment. However, whilst investigating this health application of the software in our research, we discovered that various practitioners were receiving 'paranormal' results - i.e. the images the light filtering produced were not in the 'normal' or 'expected' category. BioField Reader (BFR) VIDEO MODE displays real-time, moving images on your computer screen - from video camcorder or webcam. These clear and coloured images, after filtering through BFR, show much more information than the camera or the eye can normally see. Very fine gradations of light are revealed which give more information about the light, or energy, of a person, animal, object or environment. BFR IMAGE MODE displays images on your computer after you have filtered them. The same filters can be applied to still images as moving stream. These clear and coloured images, after filtering through BFR, show much more information than the camera or the eye can normally see. Very fine gradations of light are revealed which give more information about the light, or energy, of a person, animal, object or environment. For thousands of years there have been individuals who claim to see what has traditionally been called an ‘aura’ of light emanating from and surrounding a person. Modern terms for this phenomenon are the: Human Biofield or Human Energy Field. Some sensitives report that this Biofield gives them information about a person’s state of physical and emotional wellbeing. It may be that sensitives’ eye/brain mechanisms are different from most people’s and thus they are able to distinguish between many different subtle variations of light to be able to see emanations of light around living things. There are many subtle changes in light intensities which we are not able to distinguish with the naked eye. Biofield imaging systems, such as BioField Reader, make the normally invisible light variations visible. They do this via carefully designed electronic light filters which ascribe different colours to various, subtle intensities of light to make them visible. The colours have been chosen as they correlate closely to what many sensitives say they see in the Human Biofield in different states of health and disease. Both practitioner and client can see the biofield in real-time, moving colour - with the special BioField Reader filters applied. The moving, filtered stream can be saved or, filtered images can be captured from the video footage and saved. These can be printed out or emailed to the client. A great way for them to see their progress. A great way for you to validate your therapy. Researchers can observe their experiments in real-time. Suitable for webcams, analogue and mini DV Camcorder and video cameras with Firewire. The filters are the most important part of the BFR program which distinguishes many subtle grades or qualities of points of light, which the eye does not normally see. BFR analyses each point of light and a decoded image is the result. This decoded colour image is seen in the processed (filtered) images. Below are examples of all the BFR filters. BFR system is a research tool which provides 20 filters. This enables users to find one or more filters to suit their own area of research. All BioField Reader filters show subtle changes in gradation or frequencies of light. Some filters have the ability to filter more gradations of colour and tone and will therefore show more detail. Below is a list (not exhaustive) to give a brief, general idea of how filters have been used in research. Over 300 researchers in India use only the Standard BFR Filter 001 and have had extremely interesting results in their research. 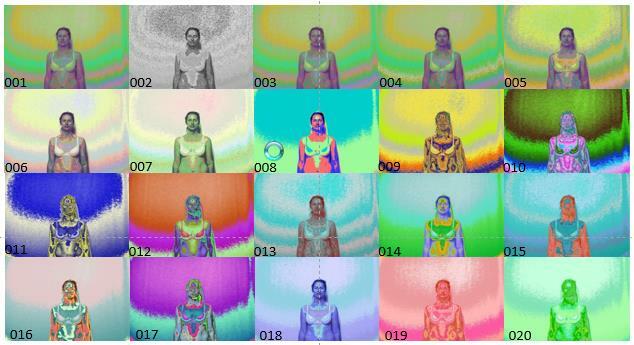 If we are performing consciousness studies then we may choose Filter 001 initially to compare differences in the biofield before, during and after the experiment. After initial analysis with Filter 001 we may run the footage through other filters to see if they reveal any other phenomena that we were unable to see with Filter 001. Filter 009 has shown interesting changes in consciousness states and trance mediumship which Filter 001 did not detect. blockages or congestion in the energy/biofield around people in areas where they store their stress or where they have known physical problems. red congested pools can also be seen before physical ‘issues’ appear. This filter has been used successfully with paranormal studies. high intensity yellow or orange spots may be seen where there are known inflammatory conditions. spirit attachments with this filter. interesting light configurations around holy men and psychic surgeons. red light/energy around some healers’ hands when they channel healing energy. Green, gold and violet emanating from other healers hands when they channel energy. during meditation red diminishing and green balance coming in which suggests that the biofield is balancing. In some instances red has intensified which may be congested energy being released. changes with qi gong, tai chi, laughter therapy, sound therapy, with positive thoughts, negative thoughts. changes seen in non-energized/energized water, homoeopathic remedies, dowsing. Can be used for Consciousness studies; changes seen when transferring thought or healing energy to crystals. in the light around people before and during use of mobile phones and also a change of light back to pre-phone use once a magnetic device ( to help protect against electro-magnetic discharge from the phone) has been applied. in the light around the heads of 'trance healers' but has not shown similar changes around the heads of normal energy/hands-on healers. when transferring thought or healing energy to crystals can. Shows chakras clearly defined in some individuals. interesting connections between heart and crown chakras whilst people are making energetic connections. changes seen when transferring thought or healing energy to crystals. Can be used for Consciousness studies. We see more general movement of energy more clearly with these filters. Focal points (where the energy is most out of balance) on humans and animals may show particularly with these filters.